The issue of how the Hospital would pay its ever-increasing costs was always pressing. The annual reports build a picture of the pressures it faced. During the period 1900-1950, ordinary expenditure always exceeded ordinary income. In 1900 the ordinary income amounted to £30,009 whilst ordinary expenditure was £47,868. The report cites the cost of coal, lights, cleaning materials, ordinary repairs, wages and the rising price of meat as reasons for the increase in expenditure. As the prices rose, so too did the number of patients. In 1900, 8,914 new patients were admitted to the Hospital; the average number of patients in the Hospital on a given day was 701. The annual report for 1939 specifically mentions the start of World War Two as contributing towards the large rise in the number of patients. It also cites the increase in the number of motor car accidents as a significant factor. By 1946, ordinary income had risen to £264,965 but expenditure was £350,108. By the 1930s, the Royal Infirmary of Edinburgh was the largest voluntary hospital in Britain. Its policy of being ‘the Ever Open Door’ with medical need as the only criteria for entry, enabled it to appeal for voluntary contributions on the broadest possible basis. In fact, as early as 1900 the annual report noted that the Hospital was dependent to a large extent on annual income derived from contributions. Each parish in Edinburgh was listed individually and within this, each church, individual and firm which contributed £1 or more. Many wealthy benefactors left money to the Hospital in their wills and bed plaques were often commissioned to record this, or wards were sometimes named after particularly generous individuals. To maintain this level of contribution, the Hospital had to have an organised system of raising money. As a result, in 1917 the League of Subscribers was instituted. At the same time, the area for collection was greatly extended with subscriptions from individual donors and parishes received from all over Scotland as well as England and Ireland. During the period from 9 May to 8 June 1928, 77 miners were admitted to the Hospital. Their admissions can be traced through the General Register of Patients. 21% were admitted due to accidents that had occurred in the mines; nearly two-thirds were diagnosed with chronic conditions. There were some admissions which cannot be categorised as either, such as typhoid. Of those who were admitted with injuries, the most common were fractures and breakages of the tibia and fibula bones in the leg. This was followed by penetrating injuries to the eye and fractures of bones in the arm. There were also several injuries to the head, spine and ribs noted. There was also a definite pattern in the types of chronic illness that the miners presented with. These conditions are all associated with the bacterium H. Pylori; presumably contained in the dirt that they were inhaling. If 77 miners were admitted to the hospital during one month, it is likely that up to 1,000 were admitted in one year. Given that the average cost per hospital bed per annum in 1928 was £149 18s 3d, the cost of the miners’ healthcare was not inconsiderable. The Hospital’s annual reports show that the miners were very generous in giving money to it. This was perhaps in recognition of the fact that many of them would require hospital treatment at some point in their lives. This generosity didn’t go unnoticed by the Hospital managers; in each annual report they were singled out for praise. In the managers’ 1946 annual report, shortly before the Hospital was handed over to the NHS, the following comment appeared: “Many groups of employee contributors outside the membership of the League of Subscribers, including particularly the workers in the mines and the oilworks who have been so consistently loyal and generous in their support of the Royal Infirmary have again contributed in substantial measure”. The money contributed by the miners was in addition to health insurance which the majority of miners had by the 1930s as a result of the 1911 Health Insurance Act. This covered the costs of their medical care. With one or two exceptions, the 77 miners admitted to the hospital in May-June 1928 were all members of an insurance scheme. The connection with the miners continued beyond the establishment of the NHS in 1948. In the 1950s, miners were sent from the Royal Infirmary of Edinburgh to the Astley Ainslie Hospital, a rehabilitation hospital. It provided for those requiring longer care and supervision to fit them for a normal life. The Astley Ainslie created a miniature mine within its grounds to rehabilitate miners. At this time, it was thought that as many as 1 in 4 miners were suffering from industrial injuries. The miniature mine enabled miners to regain their confidence and physical stamina and reacclimatise so they could return to work in the pits. 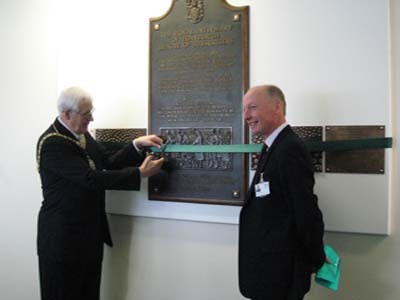 After the introduction of the NHS, it was felt that the contributions from the miners should be commemorated with a plaque. It is slightly larger than the usual size, perhaps in recognition of the size of the contributions that the miners made from their own wages. Between the years of 1918 and 1948 (when the NHS started), the coal and shale workers had contributed over £408,000 to the Royal Infirmary of Edinburgh. In today’s money, that is approximately £11 million. This plaque is the centrepiece of the 'Narratives' installation at the Royal Infirmary of Edinburgh, on the first floor, north corridor between Wards 104 and 101. Links with the past are considered important at the hospital and although there is no direct link with the miners today, it was felt important to continue to commemorate them and their efforts. The register extract is from the general register of patients of the Royal Infirmary of Edinburgh for 1928 (LHB1/126/72). The image of the opening of the Narratives exhibition is from the LHSA Photographic collection.